This is a multi-purpose ultrahigh vacuum chamber pump by means of a liquid-nitrogen filled diffusion pump operating at a base pressure of about 1�10-10 Torr. It contains an isolatable, small-volume, high-pressure cell that allows samples to be transferred directly from ultrahigh vacuum into the cell to allow catalytic reactions to be carried out on model single crystal catalysts. It is equipped with an external recirculation loop and a gas chromatograph for sample analysis. It is also doubly shielded by mu-metal to exclude magnetic fields and can be configured with a four-grid, retarding field analyzer to allow low-energy electron diffraction, intensity versus energy curves to be obtained. 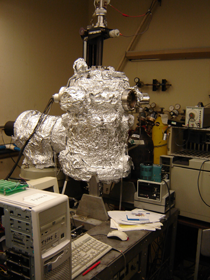 These are analyzed in collaboration with Dilano Saldin in the Department of Physics at UWM. It can also be equipped with an inert gas ion source and hemispherical electron/ion energy analyzer to allow low-energy ion scattering data to be collected to measure the composition of alloy surfaces.